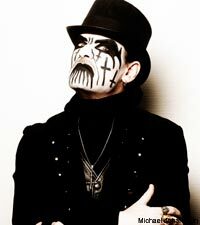 "I can't tell you how many times I said I have enough of this f---ing s---," King Diamond told Noisecreep about the reissues he is and has been working on, which include four King Diamond remasters and visual material for DVDs on tap for next year. "I will never look at this footage again. I have said that 18 to 20 times, but fans have to see it because it is so good!" Spoken like a true artist who cares about pleasing the most important person: the fan! "I never worked with any of this, and I am practically computer illiterate," King continued. "My wife does all the computer stuff. I probably make 10 cents an hour on this. It's a matter of pride and the fact that the fans got to see this because it is cool. We have Mercyful Fate stuff from 1982 that has never been bootlegged, and if anything has been seen, it's now a lot better quality for these remasters." The four remasters -- 'Spider's Lullabye,' 'Graveyard,' 'VooDoo' and 'House of God,' which are out now -- were being updated to make them "more interesting," according to King. "We wanted to make things better, perfected. Sound-wise, it's a lot better. 'Spider's' was butchered back then by those who mastered it. I am not naming names, but it was butchered and that always irritated my ear because of the sharp frequencies. It's an album that you can't salvage, but it has been made listenable now. That was one of my big problems. You hear things you couldn't hear before. It sounds unbelievable and I would like our next album to sound that way." The remasters mix bootleg material and bonus footage as downloadable files.